I couldn’t help but wonder what hygiene regulations might apply here.﻿ Is the hotel reception, which is right next to the breakfast room, somehow an inappropriate place to have food? Will the food either become contaminated or contaminate something else? Of course, the real meaning is fairly obvious: don’t eat breakfast here and then load yourself up with a second breakfast to eat later. Or, to put it another way, don’t be a greedy pig. By referring to ‘hygiene regulations’, the managers are trying to soften the message. But, for me, the euphemism doesn’t work: the reason given doesn’t make sense. 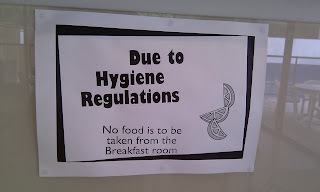 It’s clear that there are no ‘hygiene regulations’ involved here, so the sign is unlikely to have its intended effect. It just comes across as petty and miserly. I can’t think of a good and friendly reason for asking people not to remove food from the breakfast room. And the real reason would be difficult to write in an acceptable way. But why do we need to be given a reason at all? 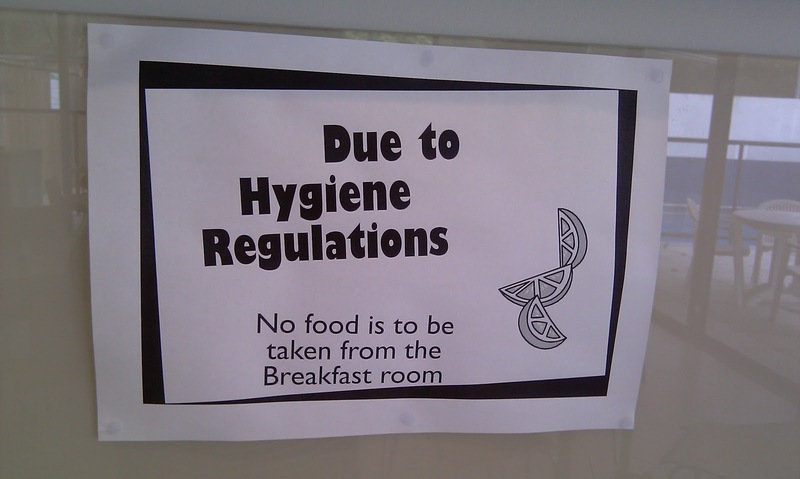 What about a simple sign that says ‘Please do not remove food from the breakfast room’? I’m aware of some psychological research that suggests people are more likely to do what they’re asked if they’re given a reason, even if the reason isn’t a strong one. But what about when the reason is absurd and contributes to the failure of the message? Surely it would be better to give no reason at all? I stayed at a hotel once that offered a buffet breakfast – complete with several signs pointing out that a buffet breakfast included two rolls, two portions of butter, jam or marmalade, and one slice each of ham and cheese. A fairly obvious restriction, I thought! Yes, I thought that hotel was petty and miserly too.